OMGFacebook changed their layout! Quick, everybody wig out. Everybody’s seen it, and we’ve all already complained about it on Twitter. Facebook updated their layout and the “most recent” is gone. They also added a mini facebook on the top right. They also creepily decided that they know what’s more important than I do. It’s a drastic change – I know – and drastic changes can take a while to adjust to. But guess what – everybody hates changes. Nobody’s going to leave facebook over this change despite their threats. It reminds me of something @DrewCurtis said at Blueglass Florida last year and has repeated over and over. People hate change. OCD is 20% of the population. People just wig out when you change things around. I know because I screw with my friends apartmentâ€¦ Wait 3 days and see if they are still upset. Main thing is donâ€™t change core functionality. If you move layout around people will get use to that, but you canâ€™t change core functionality. Iâ€™ve got people telling me that I am ruining the community because of the political hitâ€¦. Itâ€™s less than 1% if my site. If you are passionate about it and feel your right then go with it. Of course it helps when you are rightâ€¦ and you better be right. But guess what – Drew is right! 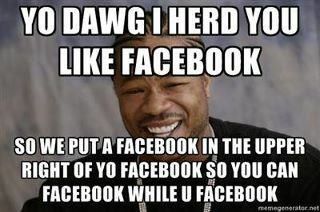 Facebook has made changes before and everybody rioted before eventually liking them. Fark has made changes. Delicious made changes. Reddit made changes. Every site site does it, and every time they do the users complain. But then a few days later something crazy happens: The users realized that the change is for the better. Just look at new Twitter. Everybody hated it, then they made it standard. Now that they’re taking it away you’d think people would be happy; but they’re not. They hated new Twitter when it came, and now they hate being switched back to old Twitter. The key to changes is like Drew says: make sure you’re right. So far, Facebook has been right. They’ve managed to last longer than any other social network has, and they’re still growing. Time will show that Facebook probably does know what’s most interesting to you. Sure, we’ll miss the “most recent” option but I’m sure in a few days it’ll either be back or it’ll be no big deal at all. My advice: Quit going crazy and bitching about the changes and start using them. You might be surprised to find that they grow on you.